Everyone knows that shingles are the first line of defense on your roof from water leaking in. Many times, when a roof ages and needs replacement, you will notice several different things when you look at the shingles. You may notice missing shingles, which will eventually allow the water to get to the wood & into your home. 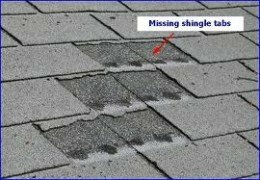 Discolored shingles that have lost the majority of their surface granulation are another spot that may be the source of the leak. When the shingles start to deteriorate you will see them start to curl up on the edges. This means they are absorbing water, and it’s only a short matter of time before they can’t absorb any more, leaving the water to find its way into the home. The valley is the portion of the roof where two different sections meet. Many times an amateur installer will run the seam straight down the middle allowing water to more easily penetrate between the resulting seam. A professional roofing contractor should put the seam up a few inches in order to avoid this problem. Because the water flows towards the valley and thus this area is one of the highest traffic points, it will show the most amount of wear and tear on the entire roof. This is another good reason to hire only experienced roofing companies to complete the job because they will go a step beyond the basics and underlay the valleys in ice and water shield as well. If this is done even when the valley wears through you will not experience any leaking. This is especially important when roofing in colder climates that experience extreme weather damage and heavy winters storms such as in Michigan. 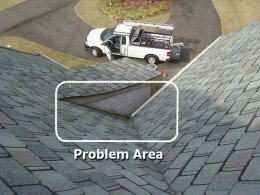 The flashing is another very common area that residential roofing customers will experience leaking. It is a tougher area to properly install, and many times smaller roofing companies simply skimp out or don’t have the skill set necessary to complete the job correctly. Look in areas such as around the chimney to see if you can spot any signs that the metal is separating from the brick. Other times the problem is less obvious, and you may only notice a slight bulging around the effected area indicating the wood is actively absorbing water and deforming. A portion of the flashing will climb up the wall and the remainder is located underneath the shingle, so pay attention to both of these places. There is also flashing around all vent pipes and skylights, both of which leak extremely often. Make sure that when you get a new roof installed, they are replacing all the existing flashing up there and not just reusing materials in order to save themselves a little money. We are certified and licensed roofing contractors. We also have over 36 years of experience in the industry. American Standard Roofing stands behind it’s work. Our reputation is important to us. We believe in never sacrificing quality for easy profits. We also stand behind our services for the lifetime of the product, both labor and material. That is why we are #1 metro Detroit roofers. Be sure to give us a call at (248) 350-2323 for all your roofing, siding and guttering needs.